XING uses OAuth 1.0 for authentication and authorization. 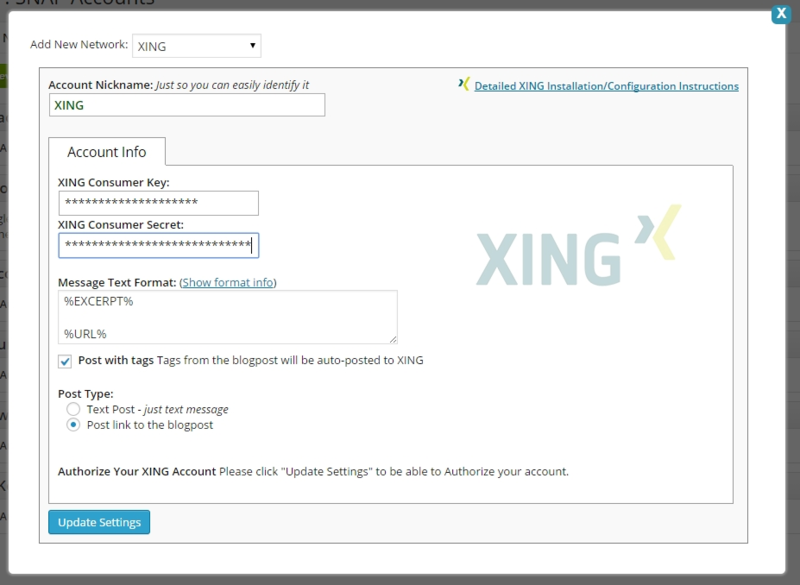 You need to setup XING Application, connect this application to your blog and authorize it. Sorry, but XING decided to discontinue it’s free public API several months ago. 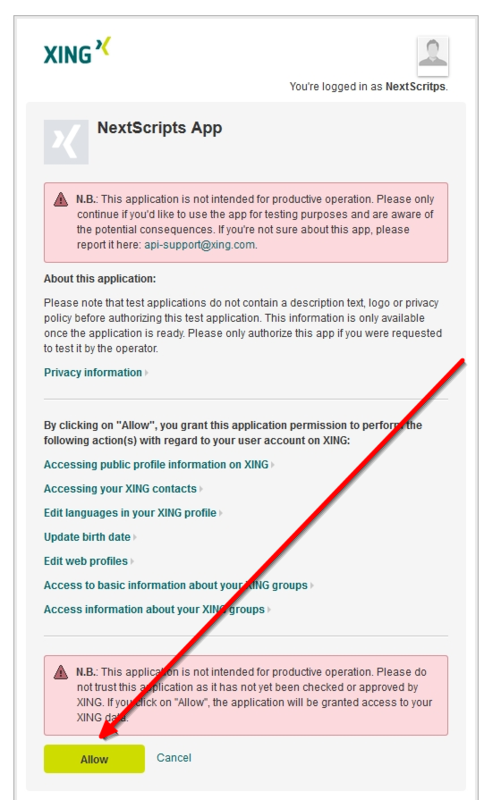 Those instructions are only for people who already have xing apps. 1. 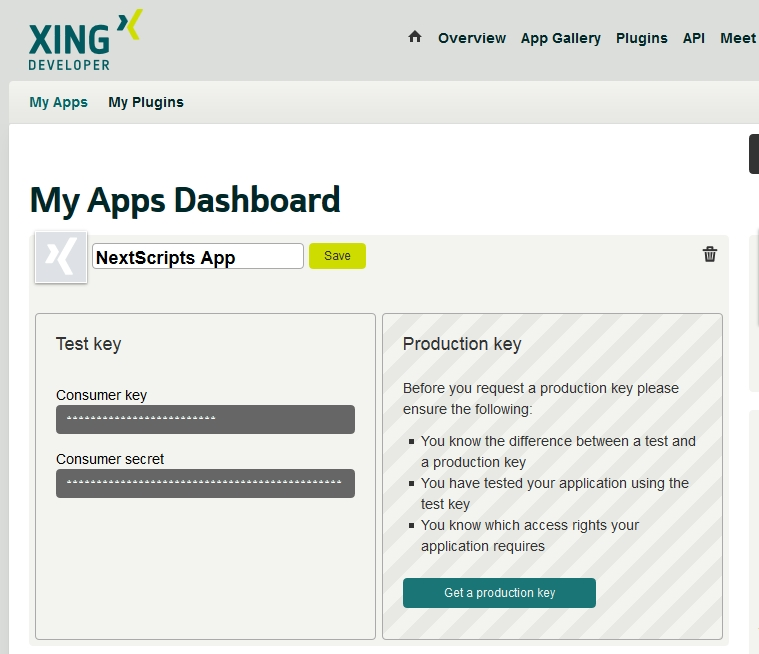 Create a XING app. 1. Login to your XING account. 3. If you already made an application you will see it’s info here, otherwise click “Create app” button. Please note. XING will give you “TEST” key. Until recently “TEST” key could’ve been used only for private posts. Right now XING says: “Each application receives a Test Consumer Key which can be used to test all of the available API calls. For security reasons the response data will be partially scrambled.“. Whatever that means, right now we don’t see any issues with posts made by SNAP with the “TEST” keys. Anyway keep that in mind and maybe try to apply for “Production Key”. Although we don’t have any success with that. Our applications were just ignored. 2. Connect XING to your WordPress. 2. Click green “Add new account” button, select “XING” from the list. 3. Fill “Consumer Key” and “Consumer Secret” from step 4 above. 3. Authorize XING for your WordPress. 1. Click “Update Settings”. Notice new link “Authorize Your Facebook Account”. 2. 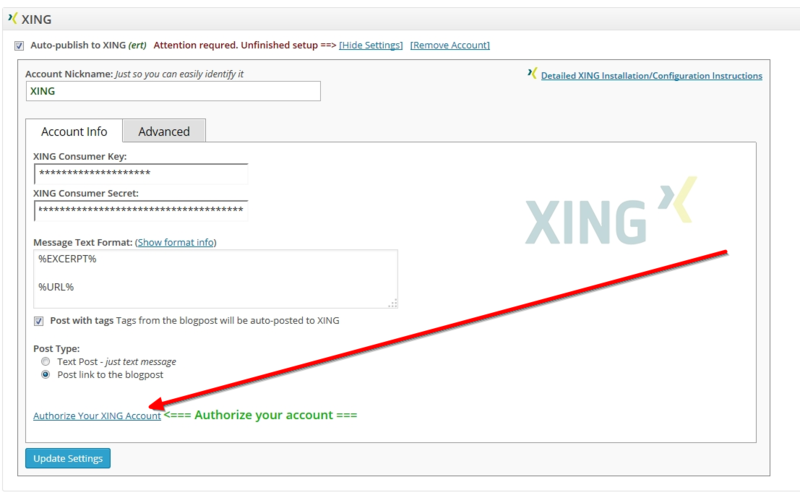 Click “Authorize Your XING Account” and follow the authorization wizard. XING will ask you to allow access to your account. 4. Your XING account is ready to use.